So upon reading this, you have to understand just how incredibly intense and important it was to capture the proposal on camera. As I arrived to Irving, I was already running late. But Chris' brother Alex had reassured me that everything was on schedule. One thing you have to make note of is that this gondola ride looks simple enough to follow and snap some pictures.WRONG. 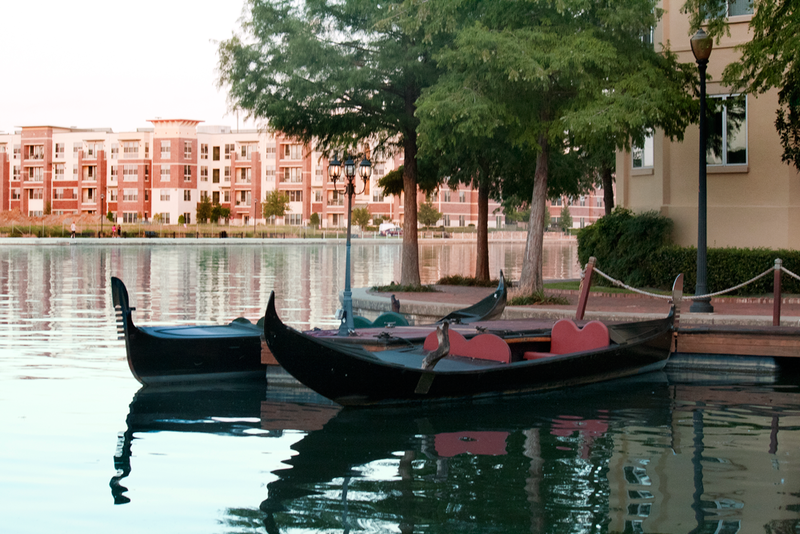 The canal travels in and out of Las Colinas where the gondola will cross and go under and over. Alex & I learned the hard way. This is one of the first images I took of Renu and Chris on the gondola. By the time the gondola was halfway from completing its ride, Alex and I sensed that we missed the actual proposal. And in all our efforts, we decided to just continue following them as best we could. Introducing Alex! In this shot below, you see a very determined Alex trying to make sure his brother's proposal is captured. Siljo (left) and Reju (right - Renu's younger brother) both are going to be groomsmen in the wedding. They were driving around while Alex and I were huffing and puffing along on foot. And as proof that Alex & I were running hard - you can see below Alex's shirt. Eventually Chris ended up revealing everything to Renu which you will see - Renu was completely taken by surprise. Our cute little friends returned to watch too! I love this photo of Chris & Alex below. Alex really cares for his younger brother and I think this photo totally shows that. If you don't know Chris - he is by far one of the sweetest guys I know and he's an even more incredibly cheesy and romantic sappy person =) He wrote a note and put it in a bottle and well...you'll see. Congratulations to the newly engaged couple! Their actual engagement pictures will be taken soon by your truly! So until then! I hope this post will keep you entertained.